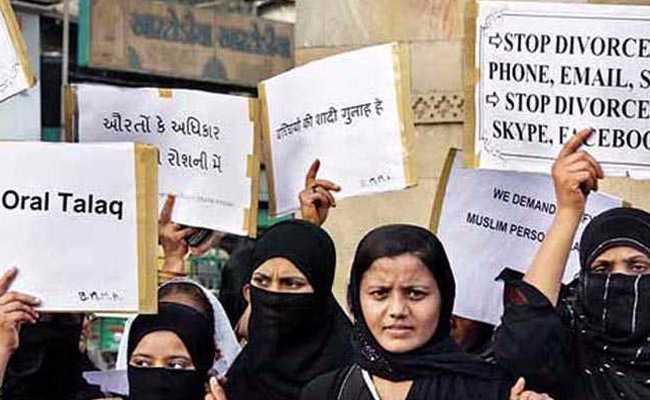 New Delhi: Union minister Mukhtar Abbas Naqvi today criticised the Congress for not passing a bill during its rule to criminalise instant "triple talaq", saying Muslim women have been struggling for their rights due to the party's failure. "Triple talaq" is the Islamic practice of men divorcing their wives by stating "talaq" (divorce) thrice. Mr Naqvi's remarks against the Congress came as the BJP-led centre today introduced a bill in the Lok Sabha to make instant "triple talaq" illegal, carrying a three-year jail term. Mr Naqvi called the introduction of "Muslim Women (Protection of Rights on Marriage) Bill" a "historic day in parliament." "The bill should have been passed long ago. Muslim women have been struggling for their constitutional rights for decades," he told reporters outside parliament. He said the Congress, which was in power for most of the past decades, could not pass the bill for "various reasons". Law Minister Ravi Shankar Prasad introduced the bill in the Lok Sabha amid opposition by members of several parties, including RJD, AIMIM, BJD and All India Muslim League. It was passed later. Outside parliament, Mr Prasad said: "It is a historic day. The bill has been introduced in the Lok Sabha to address sufferings of women due to 'triple talaq'. It will be discussed in the House and whatever I have to say about it, I will say in the House."